Our Sporades adventure started by enjoying home cooked food in a family run taverna in the port of Loutraki while meeting the rest of the group and sharing stories. Slightly bleary eyed we all met at the sea kayak center in Glossa village. Most of the kit required for the trip was already loaded into the van, all we had to do was choose a kayak and paddle, drink coffee, eat freshly baked croissants and go through the proposed route. 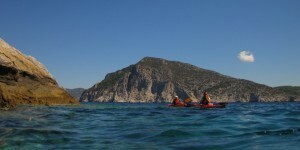 We were met by a glorious day as we loaded our kayaks at the beach in Elios. Plenty of help and guidance was given where needed. It was time for a group photo in the kayaks, then we were off, the Sporades adventure had officially started! 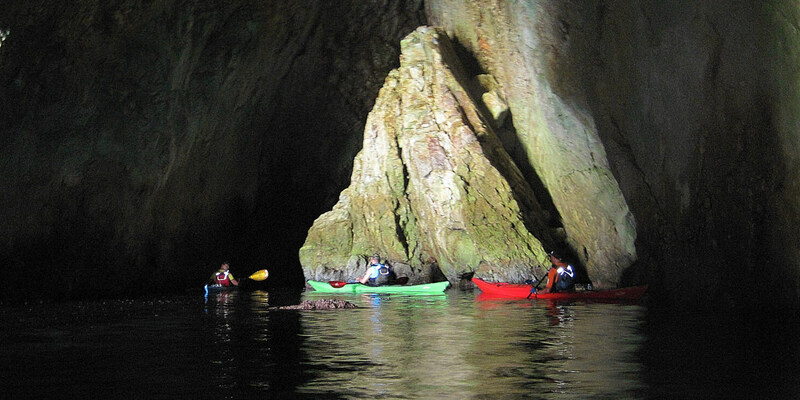 Initially following the coast for about 1km while minor adjustments were made then we turned and crossed to a small island where a large sea cave and tunnel waited to be explored. 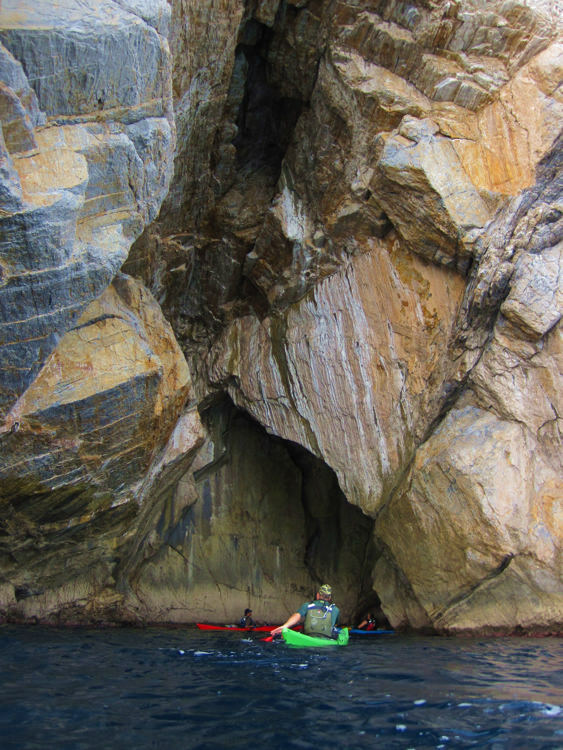 We followed the coast south, the fully loaded kayaks cutting effortlessly through the crystal clear warm waters of the Aegean sea around Skopelos, our Sporades adventure had started! Relaxing on a secluded beach reminiscing about a beautiful day while watching the sun melt into the distant islands was perfect! Our evening meal cooked and a choice of tea, coffee or wine to wash it down was enjoyed while the most amazing night sky floated above us, so much nicer to sit under the stars of the universe than the street lights of London! The first rays of the warm Greek sun landed on our backs as we ate breakfast and discussed the plans for the day. Today would see us continue our Sporades adventure by crossing to Alonissos, stop for coffee and supplies in Patateri, including more of those wonderful fresh croissants! Another deserted beach awaited us in the evening and another amazing display of stars, I could seriously get used to this! The discussions over breakfast revolved around the long day ahead of us. Our Sporades adventure would see us leave Alonissos and head to the remote island of Kyra Panagia. What an amazing day, the water was as flat as glass with views of distant islands melting into the haze. The coast along the route was littered with towering cliffs, caves and small coves to explore. The evening was spent with a feeling of total remoteness, being about as far away from civilization as it is probably able to achieve in Europe! Rudely awoken in the small hours by a sudden Mediterranean storm! Flashes lit up the night sky as the wind built quickly with the strength to move kayaks and tents along with any unsecured kit! After a frantic hour rushing about with head torches cutting through the blackness order was restored, the storm passed and it was time to return to sleep. The sun lit up another perfect day leaving no trace of the excitement only a few hours earlier. Discussions this morning centered around strong winds expected late tonight. We would spent the night at the northern most tip of Alonissos sheltering from the winds, before deciding whether we retraced our route around the sheltered coast of Alonissos or braved the exposed coast! After lunch we set out crossing the glassy waters back to Alonissos. The tranquility broken by a small splash close to our kayaks. Then another, only this time larger! A fish about 30cm long broke the surface, how exciting! Behind it the water stirred as something far bigger and more powerful moved in. The fish left the water again, this time clearing the front of one of our kayaks, but nothing prepared us for what was about to happen…. Tuna! was the squeal, as a silver, torpedo shaped, 1.5 meter leviathan rocketed out of the water, over the front of the kayak before disappearing with a large splash! Silence fell once more over the group, who all had eyes like saucers. Wow! what were the chances of that happening? 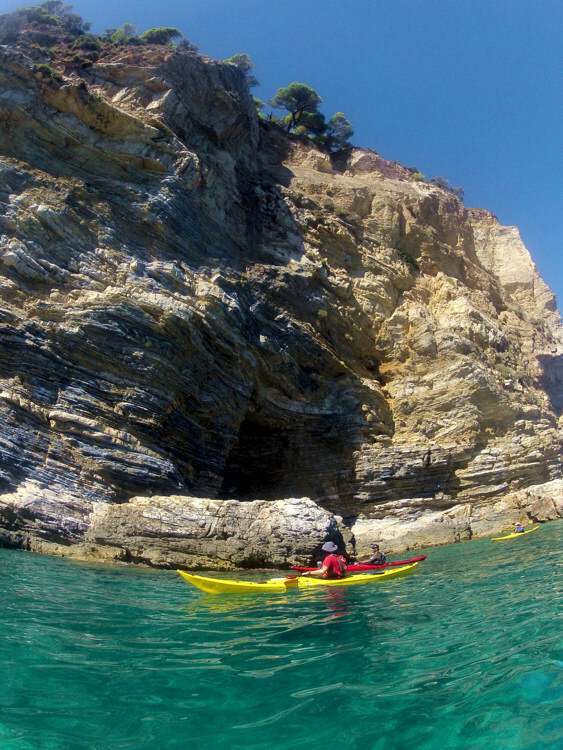 Could our Sporades adventure get any better? The wind as predicted came during the night and thoughts turned to the next day, play it safe or go for it? Let’s go for it, was the decision. A full brief and preparation of the kayaks dominated the mornings proceeding before heading out on the next phase of our Sporades adventure! The wind was forecast to drop from its peak of northerly force 7 in the night to nothing by early afternoon. We paddled into the dropping wind as the sea built for the first hour before rounding the top of Alonissos and heading south. Now with the wind and sea on our backs it was time to have some fun on the waves that reached 2.5 meters! Arguably one of the best sea kayaking experiences I have ever had, no capsizes, warm water and uninterrupted sunshine made for a perfect morning. Exhausted but happy we landed on a black sand beach for lunch and a well earned snooze. The afternoons paddle was the opposite, as the sea dropped to nothing more than a gentle swell. Our last evening on Alonissos was spent exploring the cobbled streets and stone buildings of the old town perched on top of the hill, soaking up spectacular panoramic views and enjoying superb chilli and guacamole handmade beef burgers!! Crossing back to Skopelos, thoughts started to turn to our amazing Sporades adventure drawing to a close and how would we spend our final night. The church of Agios Yannis (St John) perched on top of a rock was our lunch stop. The church made famous by the film Mamma Mia is well worth the walk up, although I do recommend you do this before lunch! The final night of our Sporades adventure was spent relaxing on another one of those amazing deserted beaches, marveling at the night sky, drinking local wine and telling stories. A paddle around the north of Skopelos held spectacular scenery and a look over our shoulders to the distant islands we have visited, it’s easy to see where the stories of the Odyssey have come from. 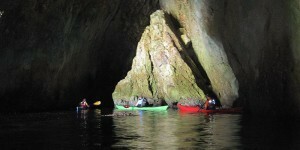 An amazing 7 days kayaking came to an end enjoying a home cooked meal in a family run taverna in Glossa with new friends!